The recently completed new honbu for Shohei Juku is located in Naka, an area west of Hakata, which is the main transportation center. 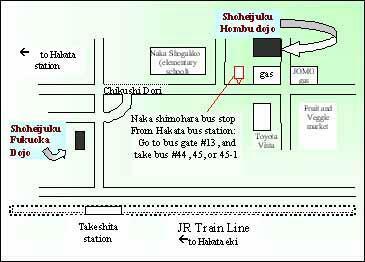 Takasago dojo is located near Tenjin, Fukuoka's main shopping center. Kyushu Island is one of the four major islands of Japan. It is the largest island in what is know as western Japan. Fukuoka is the capital of this region, and a modern cosmopolitan city. For additional information about Aikido you can visit Rainbow Plaza (8th floor IMS Building) where a selection of videos and books are on hand.